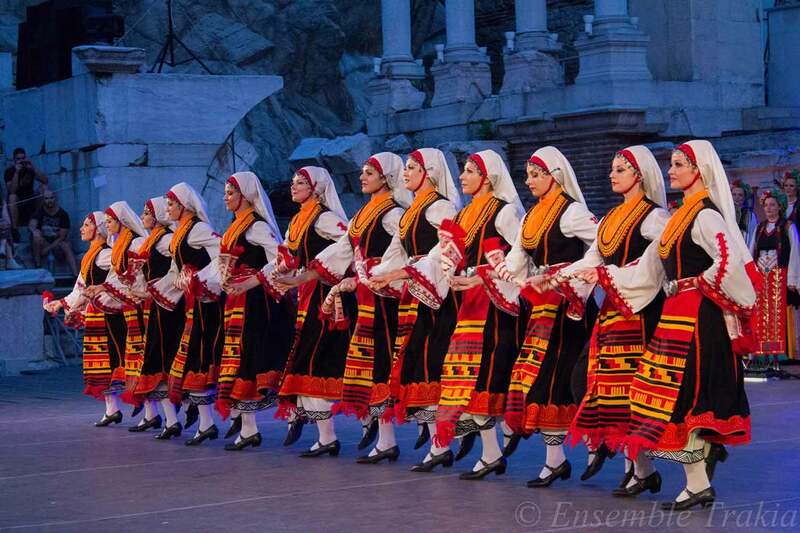 State Folklore Ensemble Trakia was established in 1974 as a budgetary organization supported by the Ministry of Culture and on 01.01.1999 it became a municipal organization supported by Plovdiv Municipality. Creative aspect of Trakia Ensemble was established by Professor Cyril Dzhenev. Prof. Kiril Dzhenev /1922 – 2006/ has been an artist, scientist and pedagogue, an emblematic name for the Bulgarian choreography and national culture. Founder of the Bulgarian folklore choreography, he created more than 100 dance works, and his work becomes a factor that affects the art of his contemporaries. 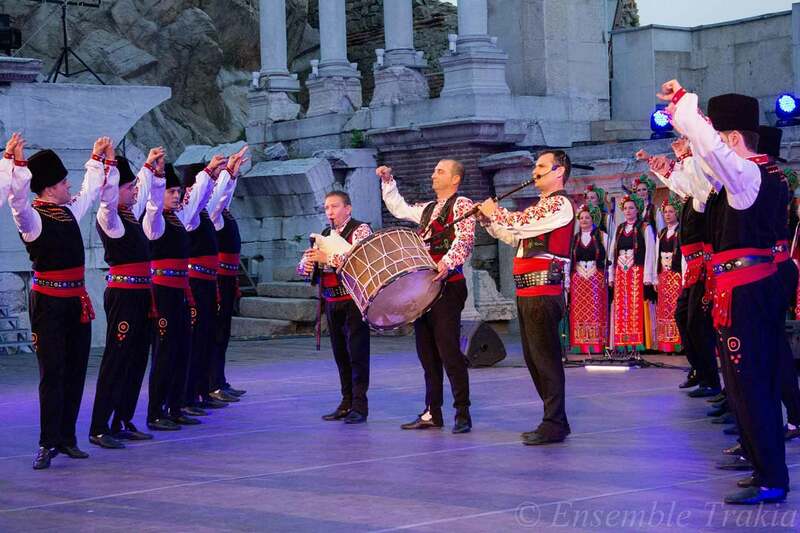 The most vivid achievement of Dzhenev is the creation of the State Folklore Ensemble Trakia Plovdiv. Author of the book “Kinetography. Professor Dzhenev is one of the most prominent educators-choreographers of Bulgaria. He teaches in the State Choreographic School since its establishment. In 1974 he laid the foundations of the “choreographic direction” at the Academy of Music, Dance and Fine Arts – Plovdiv. He develops scenarios and is a consultant on short films about folk dances. 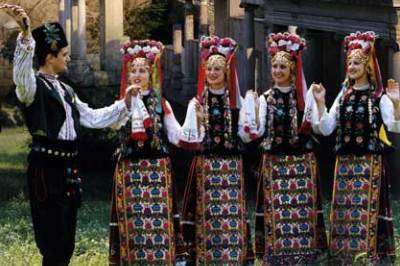 The ten-series film „The dances of Bulgarians“ will remain for the generations. It is a panorama of styles from all ethnographic regions of Bulgaria. 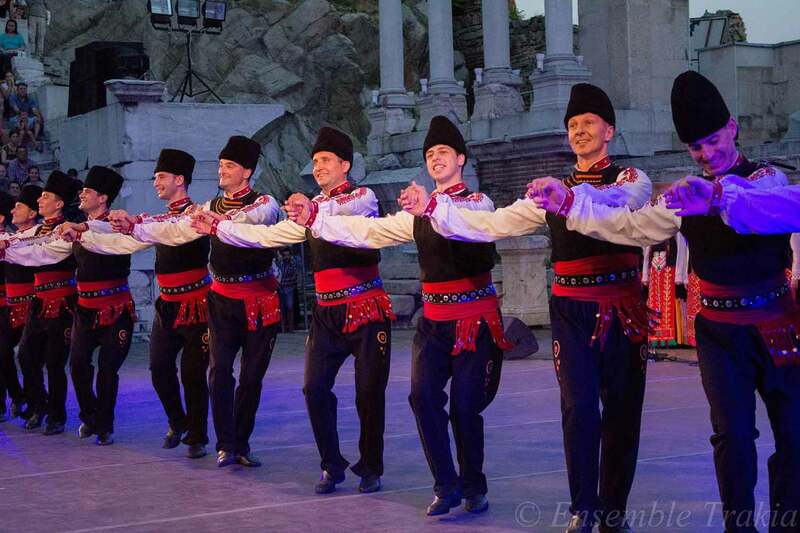 In the person of Professor Cyril Dzhenev, the Bulgarian dance art has a classic, whose school has created dozens of choreographers who continue his ideas. 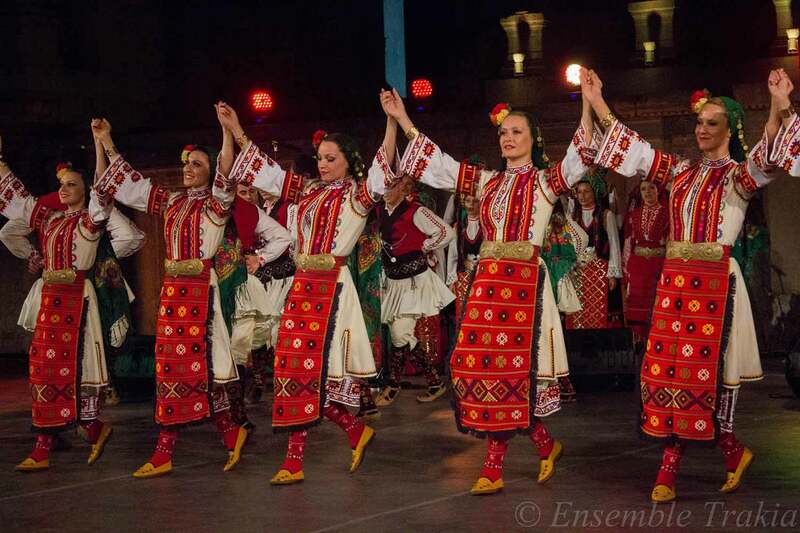 The Ensemble is developing over the years with the help of the greatest folklore authors – associate professor Stefan Mutafchiev, Professor Nikolay Stoykov, Professor Nikolay Kaufmann, Kosta Kolev, Zhivka Klinkova and many others. Associate Professor Stefan Mutafchiev (1942 – 1997) was born in the town of Targovishte. He is the author of musical-stage works, symphonic, chamber and choral music. He is a recognized name in the folk genre. A composer, who skillfully presents the musical archetype, developing and enriching it with bold, innovative and unusual artistic devices. His works are in the repertoire of the most representative ensembles in the country. His music forms Ensemble Trakia’s main repertoire. As Ensemble’s main artistic leader and conductor Stefan Mutafchiev realizes a rich concert activity and sound-recordings for Bulgarian National Radio, Bulgarian National Television, Radio Plovdiv, Stara Zagora Radio. With the Ensemble’s Choir he records his beautiful songs in the second and third CD from the series “The Mystery of Bulgarian Voices”, followed by a triumphal concert at Olympia Hall – Paris in 1990. He is a lecturer in the Academy of Music, Dance and Fine Arts Plovdiv in the Department of Music Folklore and Conductor ship. His songs are included in the folk music educational material for pupils and students in the country, as well as in the textbooks on music in general schools. He’s been honoured with prizes of the Union of Bulgarian Composers, a diploma, golden medal and crystal vase for performance and composition, he’s won the Plovdiv Prize and many other folk reviews and contests. Substantial contribution to this ceaseless creative source has always had the performers – current students and already graduated professionals from the Academy of Music, Dance and Fine Arts. The experts qualified the Trakia’s participation in the First Review of state and professional ensembles for folk songs and dances in Blagoev in 1976 as the culmination of the whole review. Ten years later, during the third review in Kyustendil /the only competitive review/ Trakia won six first and two second prizes in all sections of authorship and performance. 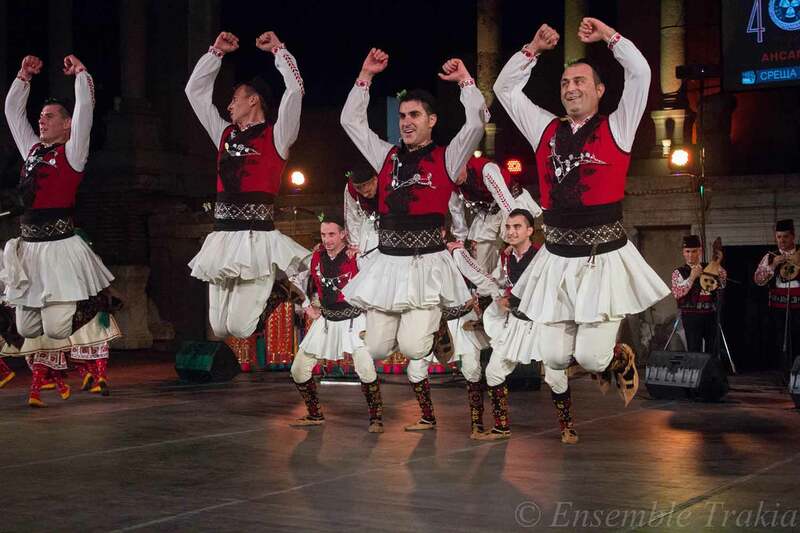 Already 35 years Trakia Ensemble has been an innovator in music and dance forms. It has not even for a moment interrupted the bond between contemporary art and the deep roots of Bulgarian folklore, rituals and legends. 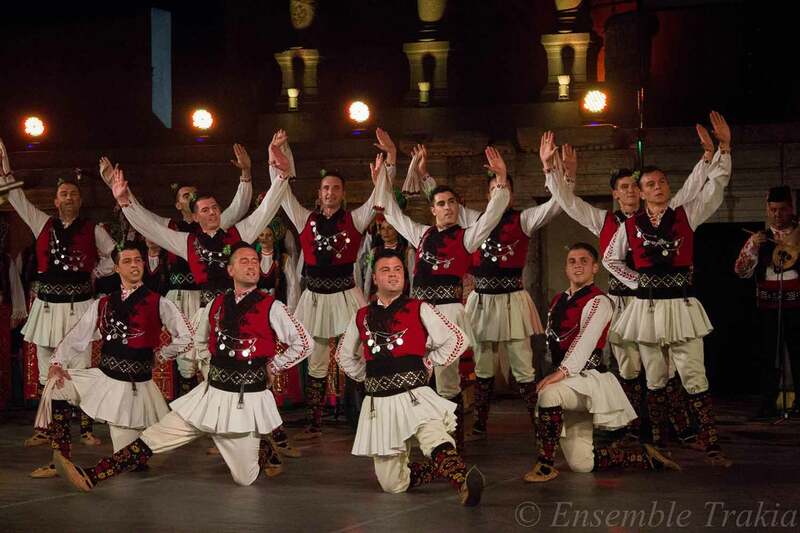 The ensemble performances come out within the framework of the traditional concerts and in a brilliant way disclose the vast folklore wealth from all ethnographic areas of Bulgaria. The Ensemble has performed thousands of concerts in all parts of Bulgaria and in 48 countries around the world like: France, Italy, Belgium, Germany, Israel, Japan, India, Mexico, Colombia, Syria, Algeria and many others. Hundreds and thousands of fans possess Trakia’s tape, disc or record. 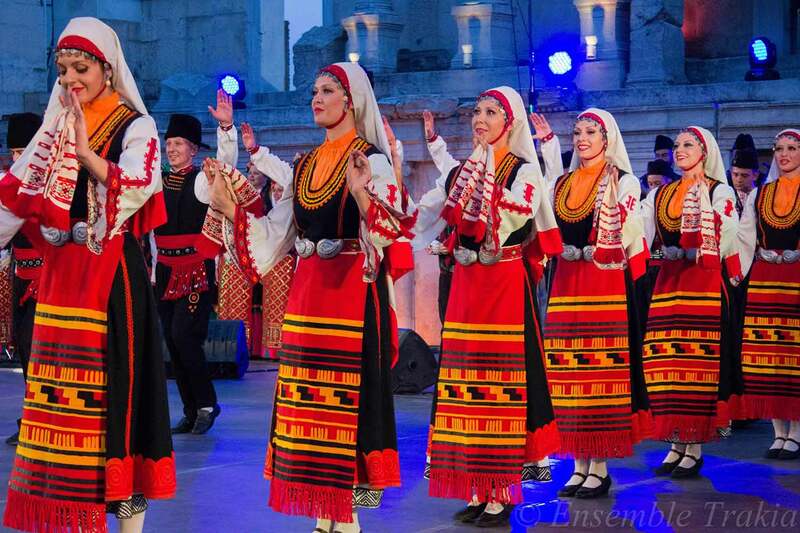 The Ensemble left in the treasury of Bulgarian National Television the 10-series film „The dances of Bulgarians“ and other artistic films and concert recordings. 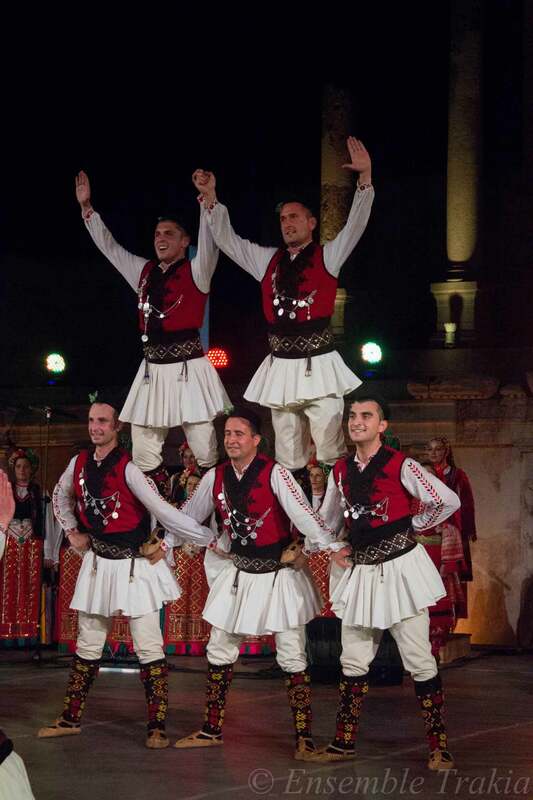 They will allow the audience see and enjoy the uniqueness of Bulgarian songs, costumes and dances. The Trakia Choir recorded the beautiful songs on the second and third CD from the series “The Mystery of Bulgarian Voices” together with Marcel Cellier. The Choir had a huge success in the Olympia Hall – Paris 1990. It was nominated for Grammy and reached the third place in the Billboard chart.